A total of S$16.8 million in financial penalties and settlements was slapped on 42 financial institutions here as part of enforcement actions taken by the Monetary Authority of Singapore (MAS) between July 2017 and December 2018. 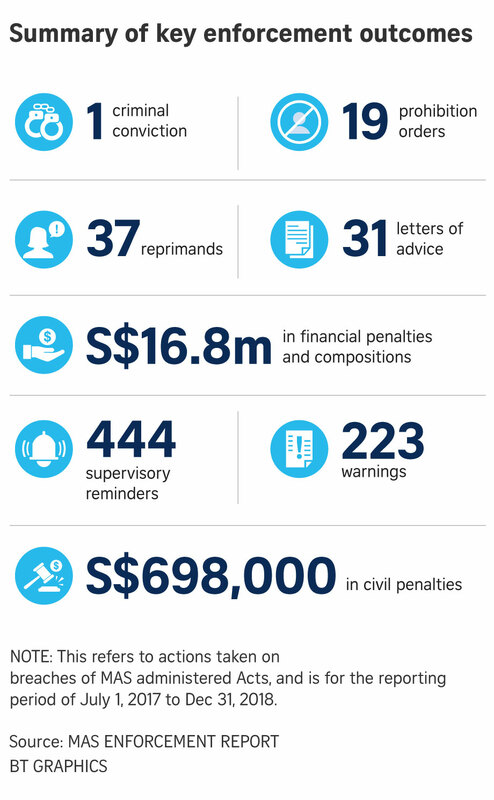 The fines come alongside action taken against various misconduct that include one criminal conviction for false trading, S$698,000 in civil penalties for misconduct in trading, 19 prohibition orders that bar individuals from working in the financial industry, and 223 warnings. These figures were revealed as part of MAS’s first enforcement report published on Wednesday, and that will be made public every 18 months. The report updates the market on enforcement matters in the financial markets undertaken by MAS. It also offers greater transparency on MAS’s enforcement outcomes and strategies, the regulator said in its report. They exclude actions from investigations led by the Commercial Affairs Department (CAD) in the MAS-CAD joint investigation arrangement. The financial penalties also largely exclude the S$30 million levied on private banks for various breaches of anti-money laundering requirements tied to the 1Malaysia Development Bhd (1MDB) scandal. The 1MDB-related penalties were mainly slapped on these financial firms before July 2017. But the S$16.8 million in financial penalties in the 18 months ended December 2018 would include the S$6.4 million in fines imposed on Standard Chartered Bank and Standard Chartered Trust in March 2018 over anti-money laundering breaches. The trust accounts of StanChart’s customers were transferred from an overseas branch of Standard Chartered Trust to its Singapore branch, but occurred shortly before that overseas branch implemented additional common reporting standards. These transfers raised questions of whether clients were avoiding reporting obligations that are used to deter global tax evasion. MAS had found the risk management and controls of the bank to be “unsatisfactory”. Following the 1MDB scandal that dented Singapore’s reputation as a clean financial centre, MAS had said it would make public its sanctions against financial institutions that run afoul of anti-money laundering rules persistently or egregiously. The regulator had said it now sees benefits from "judiciously" naming and shaming banks that fail anti-money laundering standards. The report comes after the MAS set up, in 2016, a dedicated enforcement department to centralise its enforcement functions across the banking, insurance, capital markets and other regulated sectors. “This move has energised our enforcement efforts by deepening our expertise in this area, and enabled MAS to take swift and tough regulatory actions against financial institutions and individuals who breach the rules that we administer,” the regulator said. The enforcement department also works with other regulators in Singapore, and those abroad. Between July 2017 and December 2018, MAS referred seven investigation cases to the Attorney-General’s Chambers for criminal prosecution or civil penalty action. It also aided in 119 requests via the International Organization of Securities Commission that came from 22 international regulators in total.